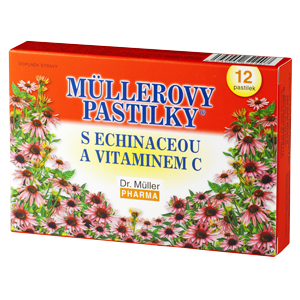 Echinacea purpurea or purple coneflower which is used in a traditional folk medicine in various parts of the world is also known as Rudbeckia purpurea. It was used by Northamerican Indians, who called it “The Sun Hat”, as a traditional curative plant, as early as two hundred years ago. Modern medicine in Europe and North America started to use this plant at the turn of the 19th and 20th centuries. 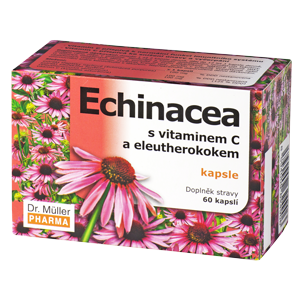 In the USA Echinacea was inscribed in the National Registry of Drugs in 1926. However, the biggest attention was paid to its practical and research aspects in Europe in the 2nd half of the 20th century, mainly in Germany, where it became one of the most used curative plants. Essential oils, fatty acids, phenolic substances and polysaccharides are obtained from this plant. 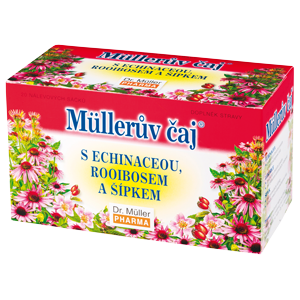 Adults – 1 to 2 capsules daily; children up to the age of 12 – 1 capsule daily, preferably in the morning or at noon. Swallow the capsule and follow with sufficient amount of some drink. Do not exceed the recommended doses. The product does not substitute varied diet. Not suitable for children up to the age of 3. Not suitable for pregnant women. Some active substances in the plants can increase blood pressure; if you suffer from hypertension or a heart disease, please consult a physician. Keep out of the sight and reach of children.